The trap man cat carriers are a range of baskets that are made in the UK, manufactured from heavy duty square wire mesh with an electro plated coated for a longer lasting non peeling finish. The baskets are top opening with a bar and eye fastener for a secure close and has a heavy duty handle on the top for easy carrying. The cat transfer basket has also has a sliding side door that mates up with the range of Trap Man cat traps making it easier to transfer the more aggressive cats into the cat carrier. Internal crush pad for easy vaccinations. The cat transfer crush basket has a sliding side door that mates up with the range of Trap Man cat traps making it easier to transfer the more aggressive cats into the cat carrier, it also has an internal wire mesh pad with two handle that are accessed at the front of the cage these are used to gently pull the more aggressive cats to the side of the cage to make it easier and safer to vaccinate. 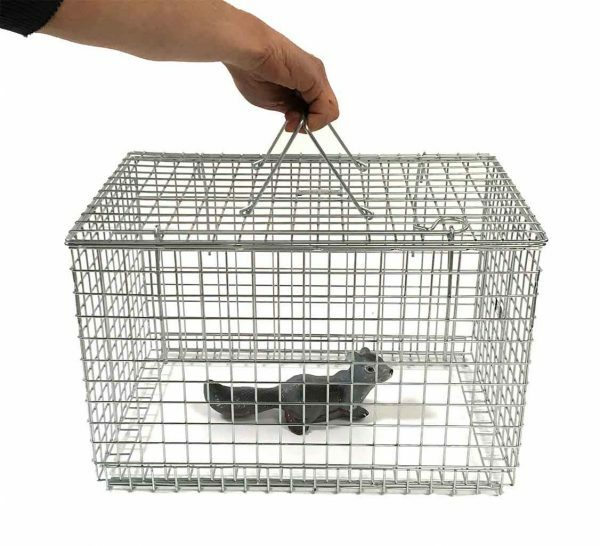 The trap man cat carriers are a range of baskets that are made in the UK, manufactured from heavy duty square wire mesh with an electro plated coated for a longer lasting non pealing finish. The cat crush basket has an internal wire mesh pad with two handle that are accessed at the front of the cage these are used to gently pull the more aggressive cats to the side of the cage to make it easier and safer to vaccinate.